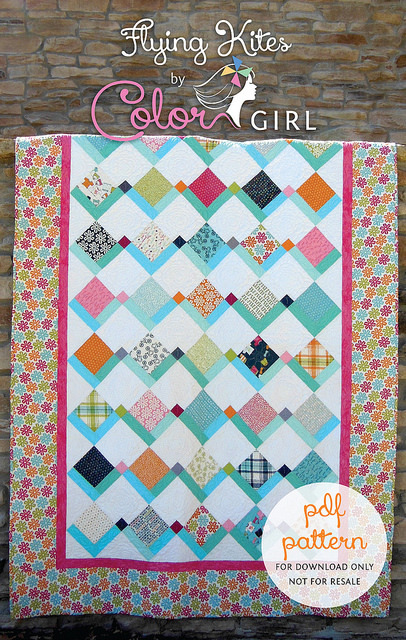 I am so happy to share a new Color Girl pattern with you! “Flying Kites” was originally published last summer, but has now undergone my re-branding with more size options and improved graphics. It is available to purchase as an immediate download in my Craftsy Shop. This pattern is great for a confident beginner quilter, with simple to piece blocks set on-point. I made the original quilt, shown above, with a Moda charm pack of the “Lucy’s Crab Shack” collection. This size option requires only one charm pack and finishes at 39″x60″ without borders or 54″x76″ with the borders: perfect for naps! The “Flying Kites” pattern also includes fabric requirements, instructions and full layout diagram for a queen/king size, which requires just two charm packs plus yardage. 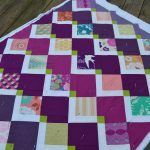 This quilt is such a great way to showcase an entire collection of favorite prints, scraps (you only need 5″ squares) or would be a fun way to do an “I-SPY” quilt with novelty prints. These charm squares are from the “Bungalow” collection by Joel Dewberry. This pack only had 30 squares (instead of 42, which come in the Moda brand packs), and makes a really quick-sew baby quilt. 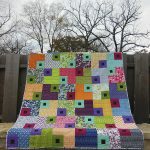 As with most Color Girl patterns, I included some suggestions in the pattern for variations if you want to make your quilt unique or more challenging. So pretty. I really like the purple one! This pattern is really adaptable. 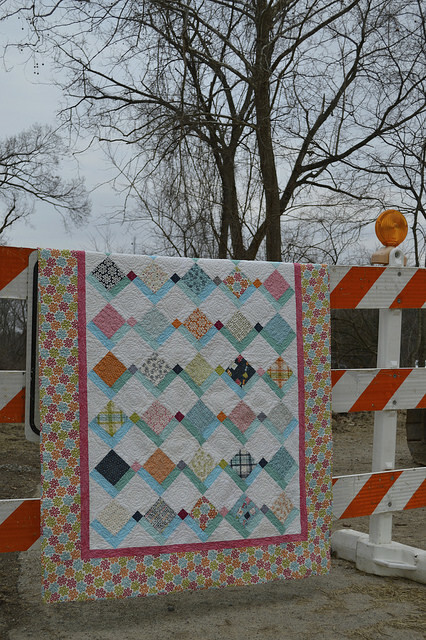 This summer I plan to not only finish all my WIPS, but to sew at least 4 new quilts. I’m dreaming, aren’t I? I also plan to spend a lot of time outside, exercise, and redo furniture. You’ll be wondering next if I live on the funny farm, LOL. Very versatile pattern. I’m planning to finish all my ( many ) WIP’S and make a medallion quilt, as well as lose weight, get more exercise and finish remodelling my house! Thanks for the chance. My big goal is four memory quilt. So happy and springy! 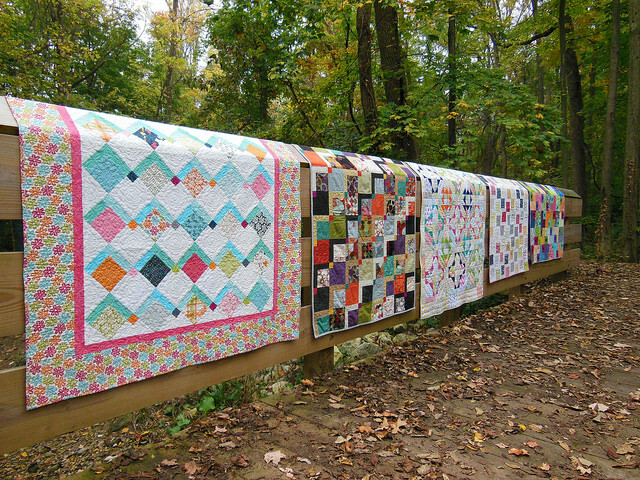 My plans include quilts for Christmas presents for the Grandbabies! All five!!! My projects include getting my flimsies quilted into tops. I’m getting my new longarm! My goal is to try and finish a quilt a month this year. Sweet pattern! Plans are to finish a charity quilt, quilt another flimsy, and finish my Tea Towel Challenge quilt. I’m sure I’ll be starting another thing or two as well. I’m going to make a baby quilt for my niece who’s expecting her first baby in June!! Gorgeous new pattern. So bright and fresh. Thanks so much for sharing. I’d love to make a lap quilt. Love this pattern… hopefully I am going to get to do lots of sewing this summer. 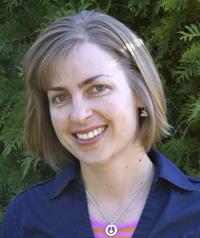 We have planned a sewing party with my daughter and granddaughter – daughter in laws are also invited. Love the summer months. I’m not entering the drawing (I won one of your awesome patterns before) but I wanted to compliment you on the great pattern and lovely photo shoots! You’re right, it would make a great ISpy quilt! I’m just finishing my first quilt for my 19yo daughter. Only binding left. Have started one for my 16 yo daughter and my Mum wants 2 single bed quilts for their guest bedroom in their holiday flat in Spain. Also have plans for a few bags. Love this example… surely I am going to get to do heaps of sewing this hot time of year summer collection. We host arranged a sewing gathering with room mates. and your flying kites are looking very good with a some texture colourful. some are looks like Buy Towels to desing on it. Just bought a new sewing machine, so I have lots of plans, mostly block piecing and a few summer tops, skirts, and dresses. Thanks for the giveaway.